While the eMachines brand may not be as well known as its rivals, it takes many successful design cues from its parent company Acer. As a result, the D620-261G16Mi (£276 inc. VAT) is a highly usable laptop, although it falls short in terms of raw performance. The compact chassis is a nice feature but, at 2.5kg, it is slightly heavier than the larger Asus. While its small size makes it comfortable to carry on the move, the 148-minute battery life is pretty low and restricts mobility. As with many older Asus laptops, the plain black design has a very corporate appearance. The use of a gun-metal finish adds style, but there is still little to differentiate it from the vast competition. Build quality is excellent, however. As with many Acer laptops, the keyboard has a 5-degree upward angle that places the keys at a more natural typing position. The keys are responsive and firmly fixed to the chassis, so usability is excellent at all times. 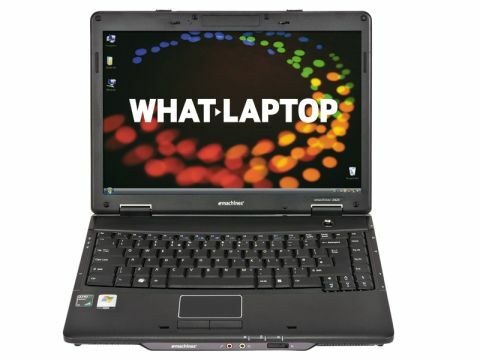 Due to the small chassis, a 14.1-inch screen has been used, rather than the 15.4-inch panels that are most common. Most users won't notice the slightly decreased screen space, however. Image quality is generally good, but colour and contrast aren't as vibrant as we would've hoped. A single-core AMD Athlon CPU has been used rather than an Intel processor and is backed by 1024MB of memory. It only suits the most basic use, such as email and browsing the internet. 3D performance is also basic. Although an ATI graphics chip is used, rather than an integrated Intel chip, this isn't a laptop built for multimedia creation. Instead it is better used for watching videos and DVDs and playing only the most basic 3D games. Storage options are mixed. The 160GB hard drive will hold most music and photo collections. The dual-layer DVD rewriter is also impressive and supports all disc formats, including DVD –RAM. However, unlike the Asus X58L and Fujitsu Esprimo V6535, there is no support for flash storage cards. While there are no extra hardware features present, the excellent bundle of free software compensates somewhat. Microsoft Works provides basic home office tools, while there are also applications for internet security, DVD viewing and CD/DVD disc creation. The eMachines D620-261G16Mi is excellent in many ways, but is also flawed in many others. Despite its compact design, excellent usability and software package, the low performance and battery life restrict its potential, so consider your needs before buying.